Running late? Think you might just grab your coffee to go or put on your makeup in the car? Think again. Anything that takes your eyes, hands, or mind off the road when you are driving is considered distracted driving. 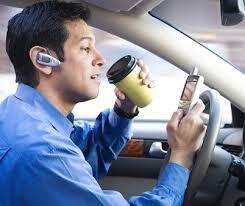 According to Distraction.gov, nearly one-fifth of all injury accidents are caused by some sort of distracted driving. So what are you doing to distract yourself from the road? Do you talk on your cell phone? Cell phone usage is the most obvious form of distracted driving. Even if you are using a hands-free device, your mind is still somewhere else. It is best to make any phone calls ahead of time, even if it is inconvenient. Texting is even worse than talking because it also takes your eyes off of the road. In fact, Distraction.gov reports that the average text takes your eyes away from the road for 4.6 seconds. That may not seem like much, but if you are driving 55 miles per hour, that is like driving the length of a football field with your eyes closed. Pretty scary, huh? To avoid any temptation, you should put your phone on silent while driving. For extra security, you can even keep it out of reach. But I don’t use my phone while I drive! That is great! However, according to AAA, there are many other forms of distracted driving that you may be participating in. Do you change the radio station? What about following the directions on your GPS? Electronics are a big source of distraction for many drivers because they take your eyes and hands off the road. It may only be for a short amount of time, but an accident only takes a second to occur. To avoid this distraction, try to have your music set before you start driving, or wait until a stoplight to change the channel. Use a GPS system that talks to you so you don’t have to take your eyes off the road. Do you ever eat while you drive? Eating and driving just seem to go together; after all, the drive-through wasn’t created for nothing. However, when you are eating, at the very least you are taking one hand off the wheel. You also probably take your eyes off the road when you go to take a bite. You can still use the drive-through; just wait until you arrive at your destination to eat. When you are driving, you need to be fully committed to keeping yourself and other drivers safe. To learn more about how to drive defensively, check out our defensive driving course.